The BodyPro deluxe is a high quality massage table at a an almost entry level price. I’ve seen it at some places for under £200 which is great value for the features. The foam is 8cms thick and you can really feel the extra comfort on this one. It has both breath hole options which I always recommend as you can choose which one you prefer and switch up for certain clients when the other one is more suitable. The breath hole in the table is very generous. The PU leather is luxurious and soft to touch yet this type of leather is actually more durable. The face cradle slots in both ends too so you can use the holes on one end for some other attachments such as a length extender or a couch roll holder. The wood is a very nice white oak colour and the legs have double height adjustment knobs for extra strength and security. 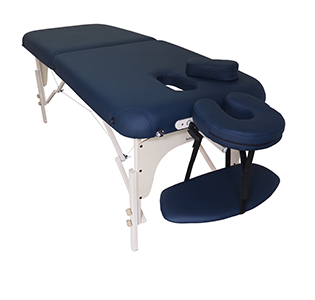 Easy access end panels make sitting on a stool more comfortable for head, neck and reflexology treatments. The carry case is a step up from other carry cases as it has foam padding on the bottom of the case. Another great feature is that it has shiatsu release cables. This lets you release the leg cable system so that the table can be used on the ground. This is handy for shiatsu and thai massage. One of the problems with cheaper massage tables is that they rock a lot. This model has what is called a cross brace which is basically a wooden support beam running from one side of the legs to the other. It prevents the table from moving or rocking during treatment. The thicker foam and wooden construction make this a heavier table than it’s aluminium counterparts so I would call this a semi-mobile massage table. Not so bad if you are taking it to and from your car but if you need to be carrying it on your shoulder a lot I would choose an alumimium massage table instead. Dear Stephen. Firstly thank you so much for putting together this site, it’s helpful to be able to read in depth reviews from a professional. I’d say 99.9% of tables are 185cms and people of 6’+ get treated on them day in day out. So yes indeed, the bodypro deluxe and any table this normal length can treat any size client. My tables are all 185cms long and I treat all sizes and am over 6′ myself. If anything, the 193cm length is just adding unnecessary extra carrying weight and people who are not tall won’t be able to put there feet off the bed and this can be uncomfortable as your toes and feet cannot go flat on the table without a bolster under the ankles. I’ve seen that “highest selling” table. Some of the reviews say pieces are falling off the table. Nowadays a lot of people just buy massage tables to massage their partner at home. A lot of these amazon tables sell in that category as they are so cheap. They don’t need to be high quality. If you want cheap go get it! If you want quality, Don’t! If you do get the cheap one, I’d be grateful if you could come back and let us know how it is holding up in a couple of months. Hi Stephen – this has been super helpful! I think I’ve got it down to the Body Pro Deluxe Active and the Body Pro Deluxe but wondering about height adjustment on the Body Pro Deluxe. You say it’s 7.5 compared to 10/10 for the active. I’m starting out and my training course starts in September. Lots of people saying to not pay much but I’m just not sure what to do?! Would appreciate your thoughts! Thanks so much for your comments, it makes it all worthwhile! I gave the BodyPro Active higher in terms of height adjustability as the legs have push button height adjustment. The wooden deluxe table has twist off knobs which take a little longer to twist off and then readjust. It’s the same with all wooden vs aluminium tables. Please keep in mind though, if only one therapist is using the massage table, you will hardly ever need to adjust the height. It really only matters when different therapists are sharing a treatment table or using one at a treatment room and they have to adjust it each time they use it. Regarding people saying not to pay much, Yes, this seems to be the trend for the past few years. I get email and messages all the time. I have attached a screenshot of one I received just yesterday. I guarantee, you or anyone else, will end up buying a 2nd couch if you go for a cheap couch on ebay or amazon. You are trying to save money but it ends up costing you much more in the end. How soon you will buy the 2nd couch will depend on how cheap you go. On the cheap cheap ones the foam is non-existent. I spoke to another lady 3 days ago who bought a shaped couch for £100 from a sport and leisure company and it squeaks and rocks. She only had it one month and has now gone and bought the BodyPro Active. So she has ended up paying around £300 in total for 2 massage tables. The BodyPro Active is great but imagine if she had just spent the £300 first off, she would have an absolutely amazing table. I also like to think that the difference in price amounts to maybe 3 treatments. I know you are not qualified yet but when you are, you just need to do 3 treatments to make up the difference. But the difference in quality is going to save you so much hassle and offer your clients so much more comfort. You asked for my thoughts! The minimum level of quality I would settle for is the BodyPro models. That lady who I spoke to the other day was very surprised at the quality level for the price. Hope this helps, I haven’t commented on here in a while and forgot how much I love to talk about this stuff! You’ve been super helpful and I’ve now bought it! Done and on its way. Quite excited to get started now. Thanks again! Ah, i can’t decide between the BodyPro Deluxe and the Body Pro Deluxe Active – and your review of the Body Pro Deluxe Active seems to have disappeared! Which is better? I think you mentioned that the Deluxe Active had a contoured face cushion – does the Deluxe also have this? Any tips would be really appreciated! I would like the table to be portable, and strong, no rocking as I am learning Sports Massage. Hi Sarah, Thanks so much for your question! Some readers emailed me to let me know the active is out of stock until January so I removed the review temporarily so as not to waste peoples time! Both have exactly the same face cushion. Pretty much everything is the same on the deluxe wooden model and the aluminium active model except for the legs. The legs are aluminium on the Active and are quicker to adjust. Neither model will rock or squeak etc, if they did they wouldn’t even get near a review by me!! I reviewed nearly 50 massage table while researching for this site and only around 10 made the list here. All the bodypro models are very very strong so you won’t go wrong with either. I would say the BodyPro Deluxe wooden leg model is slightly stronger in terms of lateral movement as it has what is called a cross brace on the legs to further restrict any side movement when you are putting pressure on the side of the table. Thanks Stephen that’s great! About to order it so looking forward to getting my first table! Hi Steve, great reviews – thank you! Is the Body-pro Deluxe the only table on your list for which the legs can be removed and the bed used directly on the floor? Hi Jenny, Thanks for your kind comments! shiatsu or special floor massage mat. Great to find this website, it is very helpful! I just wanted to share with you my experience with table BodyPro deluxe. The brand new model I received makes loud creaking noise after applying gentle pressure by breathing hole area. No other noises in any other edge. Also wooden reiki panel is damaged were the screwers are located, probably they were tightened too hard and panel cracked. Table itself looks very comfortable, thick and sturdy. Unfortunately it is also heavier than I thought, I placed it folded on the scale and it is 16.5 kg (with all accessories and bag stored inside). Hopefully only my model had this defects, obviously I need to return it now. I think about ordering table Porta- lite Delta 1, as it’s lighter and probably more handy for me. Do you think it is not wide enough though (64cm)? Unfortunately model delta 2 is too expensive. – I am just beginning my journey as massage therapist.